Palace Malice (Curlin–Palace Rumor, by Royal Anthem), who carried the silks of Cot Campbell and partners’ Dogwood Stable to victories in the 2013 GI Belmont S. and to a spectacular success in the GI Metropolitan H. last season, has officially been retired from racing and will enter stud in 2016 at Three Chimneys Farm, who acquired a 50% interest in the horse in September 2014. A stud fee will be announced at a later date. Bred in Kentucky by William S. Farish, Palace Malice made $25,000 at the 2011 Keeneland September sale, but blossomed over the course of the next seven months and was purchased by Dogwood for $200,000 out of the Keeneland April sale the following spring. A maiden winner at second asking, defeating subsequent Breeders’ Cup Juvenile Sprint winner Hightail (Mineshaft), Palace Malice was a close third in the GII Risen Star S. and earned a spot in the GI Kentucky Derby with a near-miss runner-up effort in the GI Toyota Blue Grass S. Unplaced after surprisingly setting fast fractions in the Run for the Roses, the bay overcame a high draw and a wide trip to defeat GI Preakness S. hero Oxbow (Awesome Again) in the Belmont and handed future champion Will Take Charge (Unbridled’s Song) a one-length defeat in the GII Jim Dandy S. Fourth to Will Take Charge in the GI Travers S. after missing the break, he was a good second facing elders for the first time in the GI Jockey Club Gold Cup and was a finalist for divisional honors alongside Will Take Charge and Derby winner Orb (Malibu Moon). 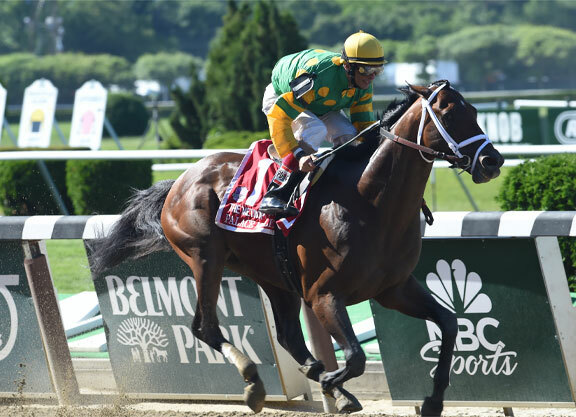 Palace Malice went on a four-race tear to kick off his 4-year-old season, posting victories in the GII Gulfstream Park H. and in the GII New Orleans H. before cutting back to Belmont’s one-turn mile for two of the year’s fastest performances. Hammered down to a nickel on the dollar for the GIII Westchester S. May 11, he rolled home a 9 3/4-length winner (114 Beyer), a performance which made him the 124-pound starting highweight for the Met against a field including defending GI Breeders’ Cup Dirt Mile hero Goldencents (Into Mischief) and subsequent GI Whitney S. winner Moreno (Ghostzapper). Drawn on the rail and giving his rivals up to 14 pounds, Palace Malice sat an inside trip, came after Goldencents in the final furlong and drove clear late to score by a length in 1:33.56, good for a 112 Beyer. Sixth as the long odds-on favorite in the Whitney, Palace Malice was first retired last September with bone bruising and Three Chimneys bought in later that month. He was third in two starts at five in 2015 and retires with a record of 19-7-4-2 and earnings of $2,691,135.